Following the euphoric rise in the gold spot price during November, December, in stark contrast, has provided a salutary lesson to all traders in that what goes up must eventually come down. The importance of good risk and money management can never be under estimated and whilst the gold bull run of November looked unstoppable clearly for the time being spot gold prices have, temporarily, hit the buffers a move first signalled by the deep hanging man in late November. 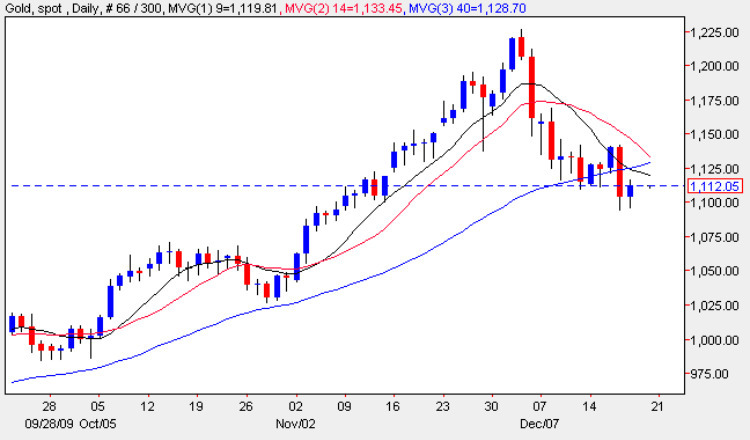 On last week’s gold chart the key signal came with Thursday’s wide spread down bar which provided a bearish engulfing signal, and whilst this was not followed through during Friday’s gold trading session, the short term picture for spot gold remains firmly bearish. This sentiment is further reinforced by the moving averages with Friday’s close ending well below all three and with the 9 day now crossing below the 40 this is adding further to the negative picture for gold prices. With little in the way of potential support now available we may even see a substantially deeper move to re-test the more significant platform in the $1050 per ounce price handle in due course, and with many traders now squaring positions ahead of Christmas holidays and year end we can expect to see some volatile and erratic price for gold prices in the next few weeks. Looking ahead to 2010 the monthly chart for the gold spot price remains firmly bullish with the current price of $1112 currently sitting well above all three moving averages which are all still pointing strongly higher, with December’s down candle likely to be seen as a short term correction before the gold market resumes its longer term upwards trend.